What type of designer are you and what is your preferred style? I’ve always been a designer who has focused on attention to detail with a leaning to the reductive nature of simple yet emboldened design. I’ve always admired the way the natural beauty, colour and texture of raw finishes can be accentuated when they are aligned or interfaced with other materials. What made you choose a chunky minimal design? For me it was always about achieving a perfectly balanced and proportioned ring for Fern. I always felt that if the right process was followed, we would end up with a beautiful and elegant design. Working with More Than Diamonds was a key part in achieving this – their insight and expertise, along with their willingness to work outside standard parameters were fundamental in achieving the final design. As a starting point, we were fortunate that Fern had quite long, elegant fingers. 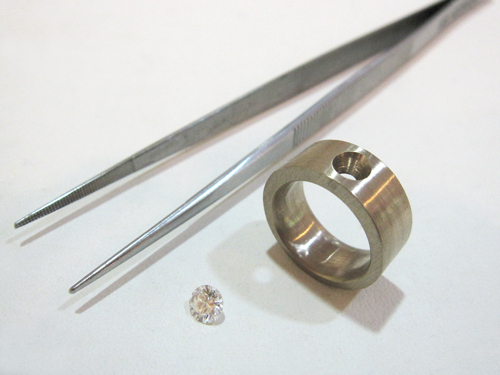 This allowed us to consider a larger proportioned ring. With the type of look I was wanting to achieve it was important that the diamond was worked seamlessly into the band and did not appear constrained. By finishing the white gold face in a matt finish we were able to create a muted backdrop that would in turn accent the natural brilliance of the diamond. The reasoning behind the polished edges was to provide a further layer of detail that would ensure the ring wouldn’t appear too raw. 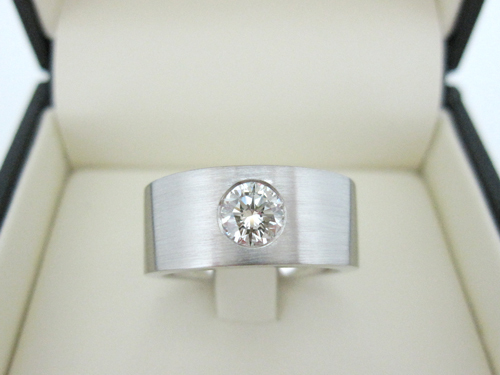 What was your fiancees reaction when she first saw the ring? To be honest, I think she was initially more taken with what the ring represented rather than the ring itself. While not unexpected, Fern’s preferred engagement ring would probably have started and stopped with a typical solitaire style ring – and this was anything but that. While of course there is an element of risk with a surprise engagement ring there is always the comfort that a lot of thought has gone into creating something that is unique and representative of the both of us. Do you think she knew that you would choose a design that is different? I’m not sure she knew what to expect. Designers can be difficult to second guess. How did you propose? Romance didn’t play a major role here – the first opportunity I had after we arrived at our hotel in Australia became our moment! It was just nice to be able to break the news to family and friends back home.